Adelaide Recycled Timbers is able to provide a safe and professional service, removing and disposing of asbestos from both domestic homes and commercial properties. We are fully licensed to remove and transport asbestos to accredited waste dumps, with an asbestos removal licence (# 86651) and an EPA Licence (# 13003). It doesn’t matter how big or small the job is, give Glynn a call on 0421 382 355 and organise a free quote appointment. 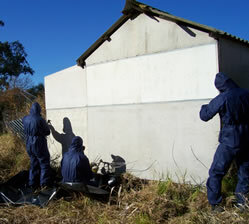 All asbestos removals are carried out by trained personnel who follow the “Code of Practice” (Dec 2011) – How to safely remove asbestos set out by SafeWork SA complying with the Work Health and Safety act 2012 (SA). All jobs with a total asbestos removal of 10m2 or more are required to have to have monitors placed by an accredited entity, around the job site to monitor airborne asbestos levels (results available on request). 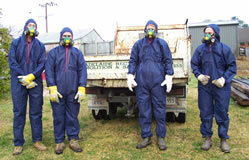 All workers are trained and aware of the hazards of asbestos removal and disposal procedures.